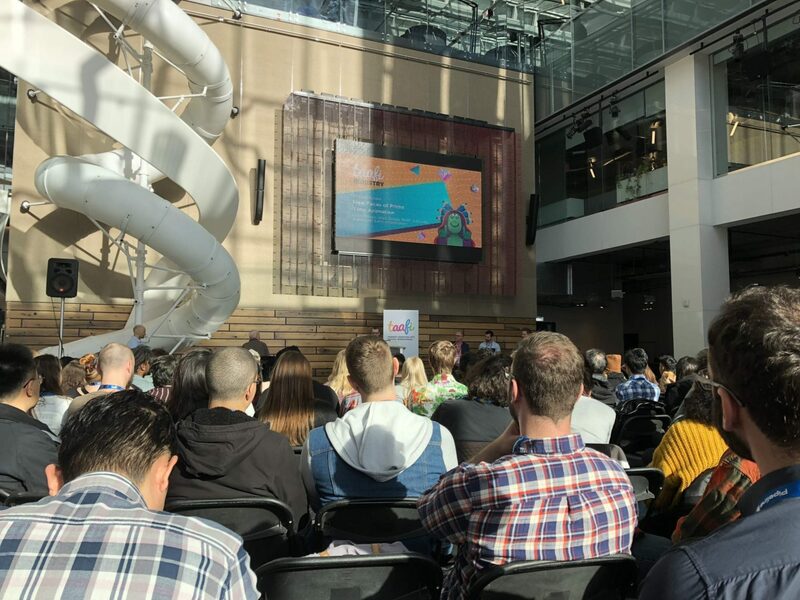 TAAFI ‘Toronto’s Animation Arts Festival’ was a whirlwind 2-day conference this past November that highlighted all the latest trends, productions, artists and creative types that have made this industry what it is and what it continues to aspire to be. Currently we are riding an exceptional period of time in the animation industry in which so many projects are creator driven and given the opportunity to be something special due to the proliferation and appetite consisting of broadcasters, streaming services, online and social media platforms. Jobs and opportunities are plentiful in this unprecedented, robust time in the industry. This version of TAAFI was something new for the organizers and, I for one, came away quite impressed. It consisted of a main atrium that focused on the majority of Ontario’s television animation industry setting up shop and looking to hire. Snowball, Brown Bag, Jam Filled, DHX to name a few all were scouting for new talent. Beyond that, the conference was spread over two venues in order to accommodate the amount of attendees, simultaneous panels and lecturers. The legendary Fred Siebert, MTV’s first creative director and the founder of Frederator, was the keynote speaker. He was quite inspiring to listen to and reiterated to artists and animators that of this moment in time in the industry that the ‘world is your oyster’ and that there is a ‘huge appetite for this medium’. We got to meet some new faces of prime-time animation such as Josh Bowen ‘Gary and his Demons’, Alan Gregg ‘Big Mouth’ and Bret Jubinville ‘Super Science Friends’. All three of these burgeoning geniuses cut their teeth doing independent work and launching their ideas through avenues such as Mondo Media, YouTube and such. Overall it was just a wide array of topics, discussions, debates and industry veterans that provided insight, expertise and put their talents on display for the appreciative crowd in attendance. I was able to connect with some old college classmates, instructors and even CAT alumni who flew in from BC on his own dime to pitch his idea for an animated series. The pitch session in itself was a popular draw and had many nervous individual’s hopeful their idea made an impression. This young grad of ours got some very positive feedback and a few leads to follow up on. Overall, very inspiring and informative. From a regional standpoint, Okanagan Film was a Bronze sponsor of the event and featured a partnership with CAT. This got some prominent view time on the main atrium screen. From an educational standpoint we garnered a lot of information for our students and can confirm that the current state of the animation industry is very healthy and looking for that next breakout idea. For more information about CAT’s animation programs, see our program overview.